Friday I was in Olympia, the capitol of Washington, at the beginning of Route 101 and the Pacific Coast Scenic Byway, which runs all the way down the Pacific coast though Washington, Oregon and California to Los Angeles. To begin Route 101 you must first travel north towards the border of Canada, then west to the Pacific Ocean before traveling south along the coast. The first place I stopped along the way was the city of Sequim. Sequim, pronounced “skwim”, has given itself the nickname “Sunny Sequim” because it sits under the rain shadow of the Olympic Mountains where it only rains about fifteen inches a year, compared to nearby Seattle which gets an annual rainfall of almost forty inches. This is ironic because its location is so close to some of the wettest rainforests of the United States. This climate anomaly is called the “blue hole of Sequim” and is responsible for the successful commercial cultivation of lavender making Sequim the “Lavender Capital of North America.” The third weekend in July is always the festive Sequim Lavender Weekend. 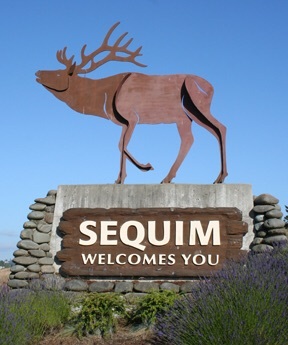 Sequim is also known for its Dungeness Crab, a large herd of over 100 Roosevelt Elk and for its recent influx of retirees looking for a pleasant location in which to retire. I recommend the Black Bear Diner for breakfast. John Wayne, the famous actor, visited Sequim Bay often on his yacht, the Wild Goose. He often talked about building a marina here and so, after his death, his family donated the necessary land so the city could build such a marina. There you will find the John Wayne Marina, as well as the Sequim Bay Yacht Club. Port Angeles also sits under the rain shadow of the Olympic Mountains receiving an average annual rainfall of 28 inches. Here you will find the headquarters of the Olympic National Park, an international airport, a ferry to take you to the city of Victoria on Vancouver Island, Canada and the birthplace of NFL football legend John Elway. There’s a right-hand turn, just before you see the town of Beaver, that puts you onto Route 112 and takes you on that solitary road to Cape Flattery, which is the northwestern-most point of the continental United States. Just as I turned the corner onto Route 112 I saw a clean-cut young man, probably about twenty years old, hitch-hiking on the roadside. Knowing that it was a half-hour drive out to the point I figured I’d give him a ride. His name was Alex Wise and he is a member of the Makah Indian Tribe. The Makah Indian Reservation encompasses most of the tip of the northwestern peninsula of Washington known as the Olympic Peninsula. The Makah people have inhabited the area for almost 4,000 years and live in and around the town of Neah Bay, Washington, which is a small fishing village along the Strait of Juan de Fuca where it meets the Pacific Ocean. Across the waters of the strait is British Columbia, Canada and Vancouver Island. As we drove the winding coastal byway out to land’s end I told Alex about the Great American Road Trip I was enjoying and he taught me about life on the reservation and the ways of his people. He told me about his schooling, which had a lot of emphasis on fishing; most of the tribe’s income comes from fishing. He mentioned a school project he completed on the art of tying fish hooks and about making canoes, which the Makah use to hunt seals, whales, salmon, halibut and shellfish. He invited me to return in late August when they have the Makah Days, a big public gathering of the Cape People, sort of a powwow, where friends, family and the public gather to enjoy traditional Indian games, canoe races, a parade and a street fair with dancing, singing, fireworks and a lot of eating. When the half hour had passed we arrived in Neah Bay as friends. We passed through the timeworn coastal village. There was a small convenience store in front of a small marina with a handful of small fishing boats and a few skiffs. Like most Indian reservations without a casino, the few small businesses, the houses, the boats, the landscape all showed signs of poverty; the Makah Tribe has about 1200 people with an unemployment rate at about 50%. Out here, at the end of the world, everyone knows everyone. Alex knew everyone we passed by name, waving to most. I offered to take him right to his house but he counter-offered to give me a tour of the reservation. I happily accepted. We drove out to a high point that overlooks the Pacific Ocean, then down to a couple of beaches. We drove up around the tribe’s sacred grounds, past the junk yard, the fish hatchery and through some of the local neighborhoods before I delivered him to his home. What an unexpected treat! Had I just driven by Alex Wise I never would’ve had such an in-depth tour of the reservation, never would’ve had such a great history lesson of the Makah and I would’ve had one less friend. You can go there too. Part of the reservation is national park lands where many people go to fish, hike the forest, camp on the beach and surf the chilly waves. I hope you take a chance with strangers, offering them a ride, a helping hand or a friendly handshake. They may affect your life in profound or subtle ways and they just might be (Alex) Wise enough to teach you some things about the world, or about yourself, that you never imagined.